Fertile, well-drained soil or roomy containers. Can tolerate light frosts in warmer areas, where cuphea can be grown as a short-lived perennial. Combine with other annuals, such as salvias. Sow cuphea seeds in moist seed starting mix and keep them warm until the seeds germinate. Most gardeners buy cuphea plants, which often are grown from rooted cuttings. Allow 30cm (12 inches) between taller varieties. This is a great summer flower for a sheltered spot or growing in a greenhouse. Snip off older branches in midsummer to keep plants looking neat, and to prolong flowering. 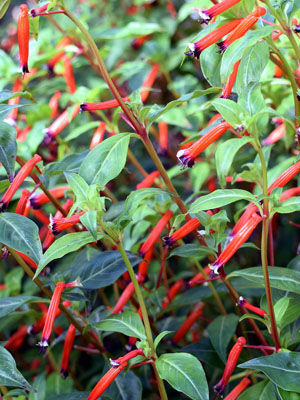 Cuphea are rarely troubled by pests or diseases.